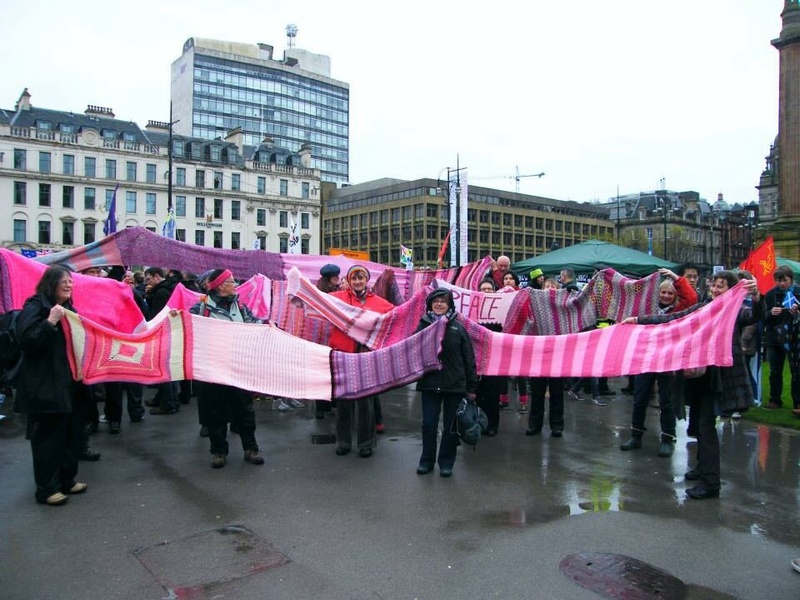 A damp and dis­mal Sat­ur­day morn­ing, but it did not deter about 40 singers turn­ing up to sup­port the walk­ers on the Spring Walk for Peace at George Square in Glas­gow. Reg­u­lars at Protest in Har­mo­ny were joined by some of the singers from the Glas­gow group; it was good to have them with us. After lots of rous­ing singing on the march the group were invit­ed up on to the stage to enter­tain the assem­bled crowd. I was unable to be on stage, a long sto­ry about a col­laps­ing gaze­bo full of pink knit­ting! So I had a superb van­tage point to lis­ten to, and sing along qui­et­ly. I have to report that the sound was real­ly good and the har­monies were clear and effec­tive. There were lots of pos­i­tive com­ments from by-standers along­side me. Thank you to all who took part and to our three song lead­ers who con­duct­ed so well, I am sure their arms will know that they had tak­en part.